We first posted this recipe on our original Teaspoon of Turmeric blog a few years back and we still get requests for this easy recipe, so I thought I would repost it here. 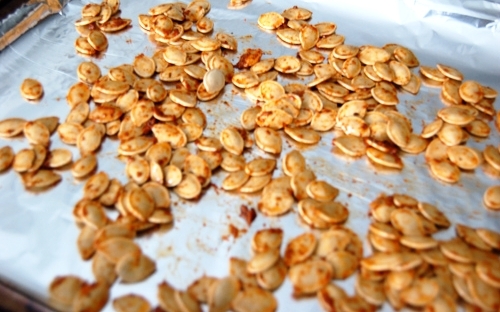 Every year during Hallowe'en I'm always sure to reserve the pumpkin seeds and roast them with one of Arvinda's masalas. The smell of pumpkin seeds from pumpkin carving alone is enough to make me want to roast them up with a touch of sea salt -- and of course a bit of spice! It really is a shame to waste something so good! 1) Soak pumpkin seeds in a bowl of hot water for 15 minutes. The pumpkin should easily fall off the seeds. Drain and pat pumpkin seeds dry. 2) Preheat oven to 300F. Line a baking sheet with foil. Set aside. 3) In a small bowl, add olive oil and stir in ARVINDA'S TIKKA MASALA. Blend and toss in pumpkin seeds. Coat well. 4) Spread on baking sheet and bake for 30 minutes. Cool before serving and enjoy as a spicy treat!